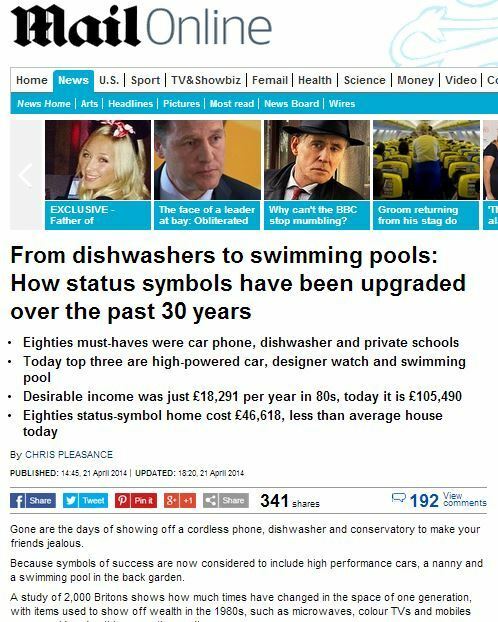 SYMBOLS of success now include a high-performance car, a nanny and a swimming pool in the back garden, a study revealed yesterday. The survey showed just how much times have changed in the space of a generation. Thirty years ago, a dishwasher, a mobile phone and a colour TV were thought of as signs of having money. In comparison, to be judged a success now you need to travel in business or first class, own a second home and have a designer watch. Gone are the days of showing off a cordless phone, dishwasher and conservatory to make your friends jealous. 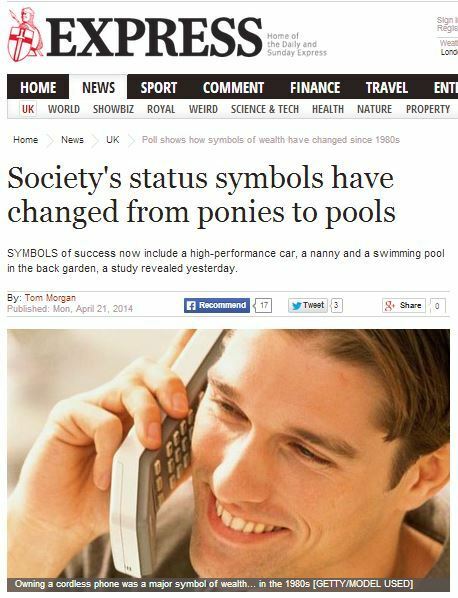 Because symbols of success are now considered to include high performance cars, a nanny and a swimming pool in the back garden. A study of 2,000 Britons shows how much times have changed in the space of one generation, with items used to show off wealth in the 1980s, such as microwaves, colour TVs and mobiles now considered nothing more than ordinary. The survey of 2,000 Britons also found that four in 10 believe people place more importance on status symbols now than in previous generations. Andy Oldham, managing director of cashback website Quidco.com, said: “Things our parents grew up dreaming of owning – a dishwasher, colour TV and even a mobile phone – are now so normal that almost everyone has them. This entry was posted in Uncategorized and tagged 72 point, Andy Oldham, chris pleasance, daily express, daily mail, onepoll, QUIDCO, tom morgan on June 4, 2014 by Michael Marshall.